When it comes to where programmatic display ads are being served, new data from AppNexus reveals that marketers are still catching up to consumers on mobile devices. About two-thirds (64%) of the campaigns run on AppNexus’ platform during Q2 2015 targeted desktop Web users, while 47% targeted mobile Web users and 32% attempted to reach mobile app users. The data comes from AppNexus’ recent Q2 2015 index report, which examines data from over 80,000 display ad campaigns. AppNexus contends that the discrepancy that exists between how consumers are using mobile devices and how marketers are targeting mobile devices “means that we can expect mobile to continue expanding at a rapid clip” as marketers keep playing catch-up. With regard to which advertisers are buying programmatic ads, it's clear that the telecom industry is taking an interest in ad tech. Real-Time Daily recently highlighted a new report from Rocket Fuel that found that most telecom advertisers and marketers are already using programmatic tech to manage digital campaigns, and that over three-fourths (78%) of them plan to boost programmatic ad spend in the next 12 months. AppNexus campaign data backs up Rocket Fuel's findings. The AppNexus report reveals that telecommunications marketers and advertisers were the No. 1 programmatic display spenders during Q2 2015, representing 29% of total U.S. ad spend on AppNexus’ exchange. Behind telcos, alcoholic beverage marketers were the next biggest spenders, representing 11% of the U.S. programmatic display market on the quarter. Financial marketers (9%), automotive and vehicles (7%), and home and decor (6%) rounded out the top-five. 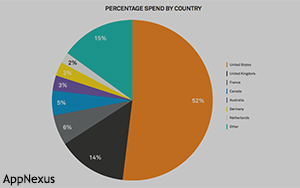 In all, over half (52%) of the ad spend on AppNexus’ platform came via the U.S. during the second quarter, followed by the UK (14%) and France (6%). The full AppNexus Q2 index report can be found here. This post was previously published in an earlier version of RTBlog. 1 comment about "Programmatic Marketers Still Catching Up To Consumers On Mobile". Scott Allan from Pure Oxygen Labs, September 21, 2015 at 9:28 a.m.